Graham Shelby says the goal of his work is to make people think, laugh and imagine. Graham Shelby has worked with CEOs, mayors, a U.S. Senate campaign, the U.S. Embassy in Japan, and radio legend Garrison Keillor of A Prairie Home Companion. His work has appeared in Reader’s Digest, Forbes, Salon, Creative Nonfiction, Kentucky Living, and has been broadcast on NPR, Marketplace, Voice of America and The Moth Radio Hour. Shelby grew up in Lexington and studied journalism at the University of Kentucky. He spent three years teaching English in Fukushima, Japan, with the Japan Exchange and Teaching Program. He is the son of writer and Chautauqua performer Anne Shelby, and longtime journalist Edmund Shelby, of Clay County. Graham Shelby lives in Louisville with his wife and three sons. Graham Shelby tells stories – sometimes his own, sometimes other people’s. And he helps clients, colleagues and students find, craft and tell their own stories. 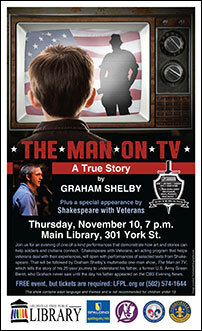 Shelby has worked in virtually every medium, from print to web, radio to stage to video, to multimedia productions like his signature one-man show, “The Man on TV,” on stage in Louisville at Kentucky Center for the Performing Arts Oct. 26-27. This one-hour performance tells the story of Shelby’s relationship with his birth father, a man Shelby laid eyes on for the first time when his father appeared on the CBS Evening News. Jimmy Godwin was a former U.S. Army Green Beret who described his postwar struggles to American TV viewers and inspired Shelby to begin a 25-year journey to track down, meet and ultimately make peace with his father, who died in 2008. 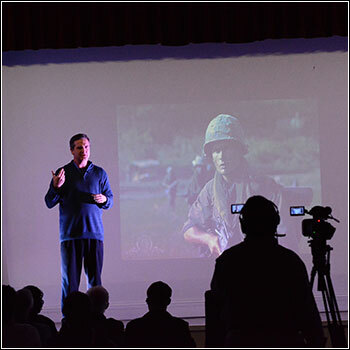 “The Man on TV” uses video, music, images and more to explore the intersection of American history and family history and to help veterans and civilians connect through storytelling. In any format, the goal of Shelby’s stories is to make people think, feel, laugh and imagine. He works to help aspiring storytellers express themselves and help audiences understand the experiences of people around them.